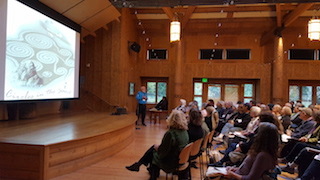 Honoring the Labyrinth Environment: Co-Creating with Nature was the 2017 Gathering theme that both men succinctly expressed in their presentations. In their own way, they were so similar in their approach and delivery, every sentence projecting their goodwill and passionate love of their life's work that has them using natural materials that reconnect people to nature and, therefore, to Source. And yet, the outcome of their artistry is so uniquely their own. Bale is a stone mason and storyteller who, in his mosaic masterpieces, interweaves the fleeting myths of human understanding with Nature's majestically slow creation stories, while Dyke, in his sandscape installations, works with those fleeting moments in time when Nature is at its most quixotic. In both walking experiences is the dance of yin and yang, Sat and Nam, permanence and impermanence, and so the walker returns filled up, surfeited, and balanced. 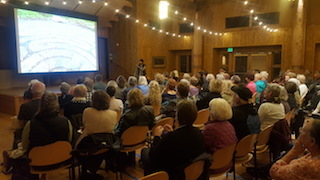 Experiencing their artistry was intrinsic to this Gathering with weekend shuttle service to and from Bale's Bainbridge Island mosaic labyrinth and a post-Gathering early Monday morning sand labyrinth installation by Denny Dyke and his crew.